Arsenal have been handed a major boost in their hopes of Champions League qualification after Unai Emery provided positive injury updates on Aaron Ramsey, Laurent Koscielny, Granit Xhaka, and Pierre-Emerick Aubameyang while admitting that his squad needs 'everybody' at this point in the season. Emery's side claimed a crucial 2-0 victory against Newcastle at the Emirates on Monday night, vaulting the north London club into third place in the Premier League table, but the win came at a cost as Ramsey was forced off with 30 minutes left to play, while Xhaka and Koscielny missed out entirely. Aubamayang played the final half hour after starting on the bench due to illness. Ramsey scored the opener with a fine first-time finish into the far corner and even captained the side despite the midfielder's long-term future residing in Turin. Aubameyang was not fit enough to start but came off the bench to assist Alexandre Lacazette for Arsenal's second of the night. Following the match, Emery eased fears over the fitness of his ailing quartet. Speaking after the win over Newcastle, as reported by the Metro, the manager said: "Aubameyang has had a temperature for two days and was doubtful to play today, But also, he is coming for us to start on the bench and after he was good and he felt good in his 30 minutes. 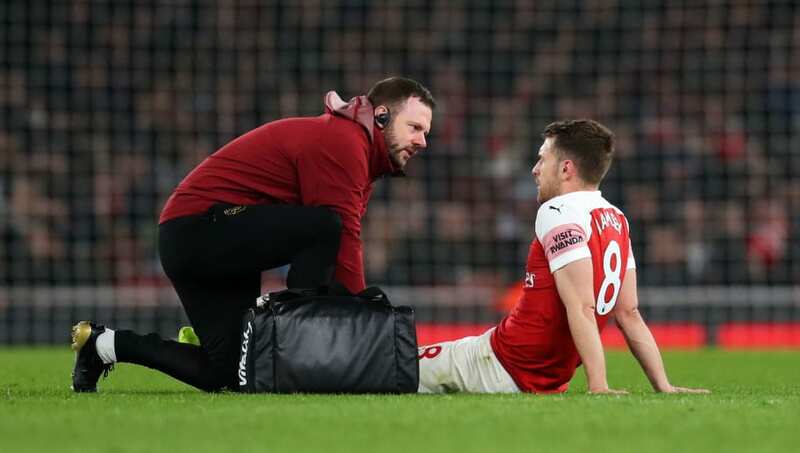 "[Aaron Ramsey came off but] it’s only cramp. I don’t think it’s more and I hope he will be ready for Sunday at Everton. "We started Friday with not good news with Xhaka, because he has a small injury and he could not play today. "Koscielny was coming with us in the group, but with some pain, and he said to us he is not ready to play the match." With a crucial April at their doorstep, Emery recognises that his squad depth will be tested, as Arsenal remain on course for a Premier League top-four finish, while they face a daunting tie with Napoli in the Europa League quarter-final stage. Speaking of the Gunners' depth in this congested period, Emery said: ‘I think we are going to play a lot of matches. "Next Sunday and Napoli are two very hard matches and we need some players to give them some chances, some different minutes with some different systems and some different tactical ideas in each match. We will need everybody." Unai Emery has equalled Arsenal’s points tally from last campaign with seven games to spare in his first season in charge. The comfortable win against Newcastle catapulted Arsenal above Tottenham in the Premier League table, with the recent accumulation of 22 points out of a possible 27 taking the Gunners from ten points behind their arch-rivals to two points ahead of Mauricio Pochettino's side.